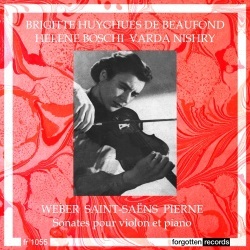 Jules Boucherit, French violinist and renowned violin pedagogue, nurtured the talents of a roster of fine violinists including Ginette Neveu, Devy Erlih, Henri Temianka, Michèle Auclair and Lola Bobesco. We can add to this list Brigitte Huyghues de Beaufond (1922-2008), also a Boucherit student at the Paris Conservatoire. Later, Jacques Thibaud mentored her. Yet, unlike the above, despite her illustrious pedigree, her name has faded into obscurity. In fact, this is the first time I’ve ever come across her. Could the absence of any commercial recordings by her be a factor? I have scoured the internet, and can find nothing whatever about her apart from what I gleaned from the accompanying booklet notes, in French only, by Alexis Galpérine. She apparently travelled extensively, and worked with some big names including Munch, Cluytens and Henri Rabaud. Huyghues de Beaufond was in her thirties when these live radio concert broadcasts were taped and, on this evidence, at the height of her powers. It’s encouraging to encounter a programme consisting of off-the-beaten-track repertoire, rather than revisiting the old, familiar, well-worn war-horses. The Pierné, for instance, is a delightful work, full of Gallic charm. Weber’s Six Sonatas Op. 10 for violin and fortepiano were commissioned as a “collection of short pieces of moderate difficulty for the domestic music-making of the upper middle classes”. When finally published in two instalments by Simrock, they bore the title “Progressive sonatas for fortepiano with obbligato violin, composed for and dedicated to amateur musicians”. Huyghues de Beaufond and Hélène Boschi play nos. 1, 3 and 5 of the set. They are short works, and the title ‘sonatina’ would have been more apposite. Not technically demanding, they are, nevertheless, full of melody, and humour – the product of an imaginative mind. Whilst this affable nature is suitably conveyed in the performances here, these sonatas fare less well from the violinist’s point of view than the other works. I notice occasionally a dull, dry note, sticking out like a sore thumb, particularly evident in the second movement Romanze of the Sonata No. 1. At other times, the ends of the occasional phrase lack climactic vibrancy. Strangely this problem seems to confine itself to the Weber works, and I couldn’t detect it elsewhere. I also found Hélène Boschi’s rather pedestrian contributions not as satisfying as those of Varda Nishry. The Violin Sonata No. 1 in D minor by Saint-Saëns calls for both eloquence in the lyrical sections and virtuosity. In the opening movement the players capture the underlying tension and drama. In the final movement, which is almost a moto perpetuo, the violinist certainly shows her mettle. The crisp and incisive spiccato is an impressive feature of her gleaming virtuosity, and her traversal easily stands comparison with the two Heifetz recordings. It was for Jacques Thibaud that Pierné composed his Violin Sonata in 1900. The work provides something of a contrast to the preceding work in that it is less daring and dramatic. This performance is idiomatic and convincing, and its success can be attributed in part to the involved and sympathetic contribution of Varda Nishry, especially in the raptly intense finale. Huyghues de Beaufond’s variegated tonal palette adds subtle colour to this hauntingly evocative score. There’s certainly some compelling music-making here, and I’m thrilled to make the acquaintance of Brigitte Huyghues de Beaufond. The broadcasts are in fine, warm and intimate sound, and I couldn’t detect the presence of any audience. I wonder if there are any more examples of this violinist’s playing out there.